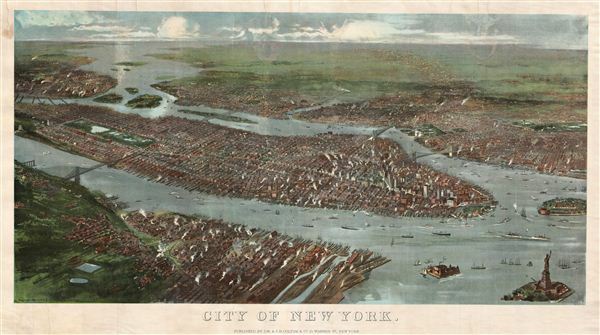 Possibly the only surviving example of this remarkable 19th century Manhattan Birds-Eye View. A rare possibly unique find, this is G. W. and C. B. Colton's magnificent 1897 panoramic birds-eye view of New York City. Presented in chromolithograph color this map reveals Manhattan, Brooklyn, and Queens as seen from high above Jersey City and Hoboken, which themselves appear in the lower left quadrant. The area covered runs from the Bronx to the Statue of Liberty and from Hoboken to Brooklyn and Governor's Island. The map is presented from a looking east from high above Hoboken and Jersey City – an unusual take on the city which deviates considerably from the more common south-north Manhattan views by Currier and Ives, and others. This might be explained by the development of Upper Manhattan, most notably the Upper West Side and Central Park, late in second half of the 19th century. The artist would have wanted to represent these newly affluent areas so that his view would appeal to the widest possible audience. Several bridges are noted including the Brooklyn Bridge (completed in 1883), the Williamsburg Bridge (opened in 1903 but under construction as this view was being drawn), the Queensboro Bridge (proposed but, as this map was being drawn, as not as yet under construction), and a curious bridge that never materialized crossing the Hudson to Hoboken at 59th Street. Central Park is clearly visible, as are the Statue of Liberty in the lower right quadrant, St. John the Divine in the upper left, and Brooklyn's Prospect Park in the upper right. New York's signature grid system is clearly represented as are many individual buildings, many of which still stand today. The rivers, and harbor are teaming with life as countless ships of all shapes and sizes visit the many wharves on both size of the River. Smoke escapes many chimneys throughout, though especially in lower Manhattan and Jersey City, giving evidence to New York's late 19th century industry. This piece is exceedingly rare and we have been able to identify no record of it in any publication or major collection. It is not referenced by Stokes, it does not appear in the OCLC, has no auction records, and there are no examples in the catalogues of the Library of Congress, the New York Public Library, or the New York Historical Society. Since the Colton firm would have produced this map in the final days of operation, in fact it is the latest Colton publication we have come across, it is reasonable to speculate that this view may never reached the production stage and is merely a prototype. Such would account for its uncommon rarity – indeed, this may well be the only example in existence. Very good condition. View exhibits some restoration work in the upper quadrants. Backed on linen.